The key to quickly navigating complex data sets is to turn them into elegant, simple visualizations that do the hard work for you. We think our new PlumTM Print does exactly that. With one glance, it’s easy way to see the relative impact of each of the five categories of metrics – usage, captures, mentions, social media, citations – that we track (see this post for more information on these categories). A simple mouseover over the Plum Print quickly shows the metrics behind the visualization. We have always included data visualizations as part of PlumXTM, in fact, one of our first data visualizations was the sunburst used to visualize a researcher’s output. We also wrote about this in a previous post. The Plum Print is a natural evolution of that effort, designed to work at the artifact level, and carries forward the work we’ve done categorizing metrics. 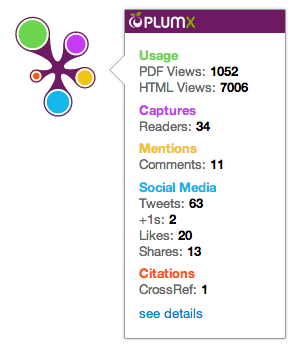 You can now see at a glance the impact of a given article, presentation, or any other research artifact. In developing the Plum Print we learned that boiling down all of the metric information to a single number was like boiling down a home to just its purchase price. A $500,000 urban Victorian built in 1880 is different from the $500,000 brand new suburban home on a cul-de-sac. Sure, both are worth the same, but that number does not even come close to telling the stories of both homes. The Plum Print visually changes based upon the metrics in each category. Each circle of the Plum Print represents one of the five categories of metrics – Usage, Captures, Mentions, Social Media or Citations. By the size of the circle, you quickly visualize the relative number of metrics, and indeed, whether there are any metrics at all in a given category. In addition to creating the Plum Print, we updated our artifact page to make it easier to see impact. Here is an example of the new artifact page. You still have the valuable and necessary information about the artifact, e.g. title, authors, journal, etc. Now, the metrics are easier to see and the impact is easier to grasp. To see the evolution of PlumX for yourself, visit the demonstration site. If you’d like to see your own researchers in PlumX, write us at plumx@ebsco.com to request a trial. To read our press release go here.